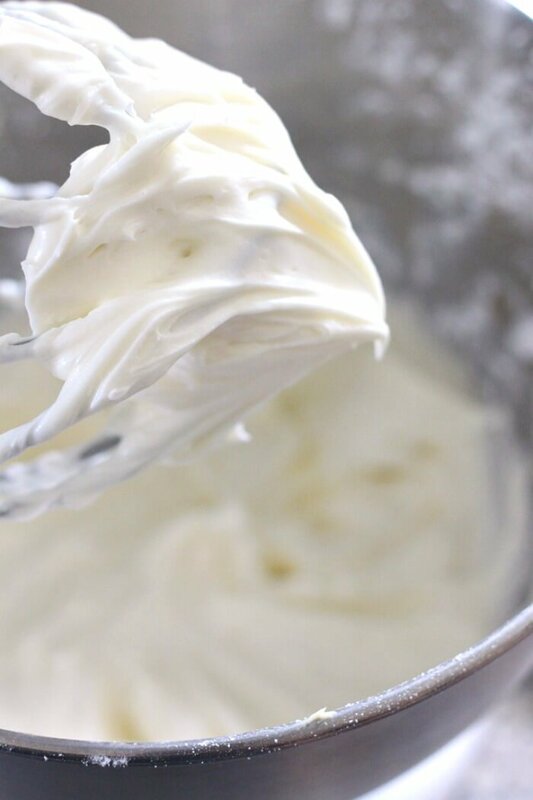 This Simple Cream Frosting only takes a couple ingredients that you probably already have in your kitchen! Growing up I was not a fan of cream cheese frosting. And then, as an adult (just a few years ago), I actually tried it and oh em gee. Life changed! It’s funny how actually tasting something can change your thinking. Hah! I am all in on this cream cheese frosting recipe now! My husband had a similar revelation with Brussels sprouts recently. Turns out they’re quite yummy! What is Cream Cheese Icing? Cream cheese icing is a slightly tangy icing made with cream cheese (think cheesecake-ish) perfect on carrot cake, red velvet cake, and in pastries! Cream cheese frosting is not typically as sweet as traditional icings. It’s also super easy to jazz up. We love this pumpkin spice cream cheese frosting made by adding a few extra spices. Butter – I’ve said it before, and I’ll say it again – I love a lower moisture butter like Kerrygold. Typically it’s European butters, but lately I’ve seen some American butters with lower moisture content available. The reason being, there’s less water and more flavor. And flavor is what we’re all about. You can always make whipped butter if you’re going for a lighter flavor or wanting to increase volume. Cream Cheese – This is not the time to go on a diet. Get the thick and creamy full fat stuff. And not the whipped stuff. You want your cream cheese dense and delicious. 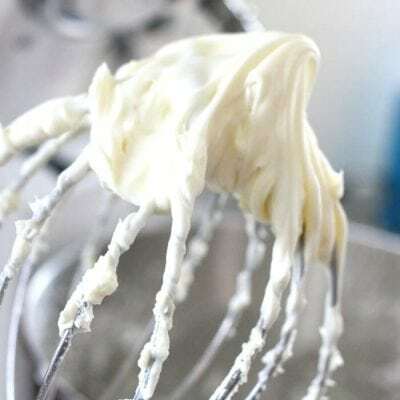 Vanilla – I implore and beg you to use real vanilla extract in this cream cheese frosting recipe. Please, and thank you. Sugar – For the sugar you’ll want to get confectioners sugar, also called powdered sugar. In a pinch, you can make powdered sugar from regular sugar in a food processor, but it’s definitely easier to just buy a bag at the market. Yes, cream cheese frosting can be used for piping! The key here is just to make sure that the frosting has enough body. Depending on where you are making this (I’m in super humid Florida), you may need to add extra powdered sugar to give it a thick enough consistency for piping. Do you have to refrigerate a cake with cream cheese frosting? You do not have to refrigerate a cake with cream cheese frosting. At least not right away. You can keep a cake on the counter (assuming your home is cool) for about two days, or in the refrigerator for up to six days. Even if it’s iced with cream cheese frosting. My mother will balk at reading this, and you definitely need to use your own judgement and comfort level, but this is how we operate in our home. If you’re storing your cake in the refrigerator, you will want to make sure it’s fully iced (not a naked cake with icing only between the layers), because the refrigerator will draw out the moisture and make the cake drier. Yes, you can freeze cream cheese frosting. You can also freeze cake. The caveat is that you’ll want to freeze them separately. Don’t freeze iced cupcakes or a whole iced cake. Freeze them separately and then once the cake and cream cheese frosting have thawed, put them together. 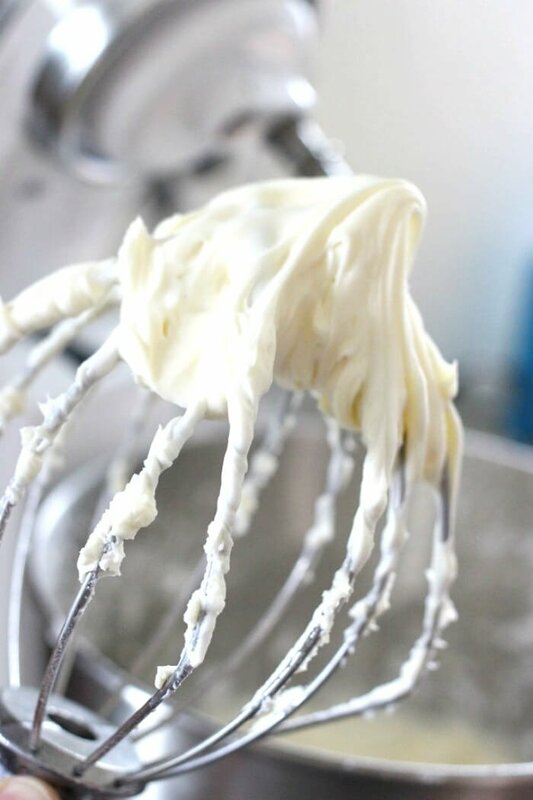 Cream cheese icing goes so well with several types of cakes and pastries! It’s a great addition especially if you want to cut the sweetness a little bit. Pumpkin spice cake – I make this all year, pumpkin season be damned. Pumpkin mug cake – For when you don’t want to share. P.S. it’s totally grain free! Carrot cake – Such a classic, made super easy by starting with a box mix. Chocolate cream cheese pastry – A total show stopper. YUM. Kitchenaid stand mixer – I love this mixer so much. I don’t use it as much as I should, but it comes in so handy for making big batches of cream cheese icing or for shredding chicken. Small mason jars – We store our leftover icing in these small mason jars. We also use them as cups sometimes! Piping set – I’ve only recently started learning how to pipe icing, and it’s so fun! This set has a ton of cool tips to try and is highly rated. Yay! You can also watch us make this Cream Cheese Frosting on YouTube along with our easy Carrot Cake! Make sure to tune in for all our live cooking shows! 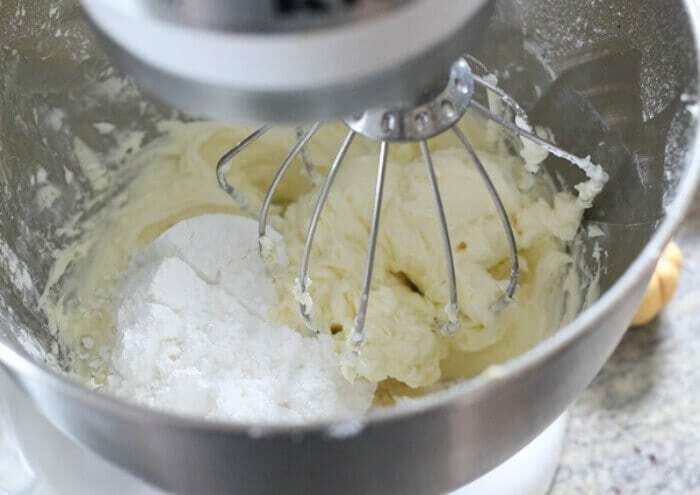 With an electric mixer or stand mixer, whisk together butter, cream cheese, and vanilla. Add powdered sugar, one half cup at a time. Beat until smooth and fully incorporated. Allow to set in the refrigerator (about 15 minutes) and ENJOY! If you want the cream cheese frosting stiff enough to pipe, slowly add up to one extra cup of powdered sugar until you reach your desired consistency. RICURA, NECESITABA ESTA RECETA, MUCHAS GRACIAS. YO AÑADI VAINILLA BLANCA. You didn’t say when to add the vanilla. One for the recipe box for sure! Such a great, versatile frosting!!! An additional cup of powdered sugar for a stiff icing, wont that make it too sweet? Are we looking for stiffness or taste, Im sorry Im confused. I dont want it too sweet that the kids cant eat it but also would like it stiff enough to pipe it. 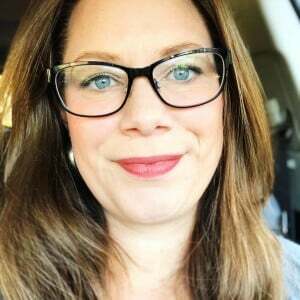 Curious what others did…..